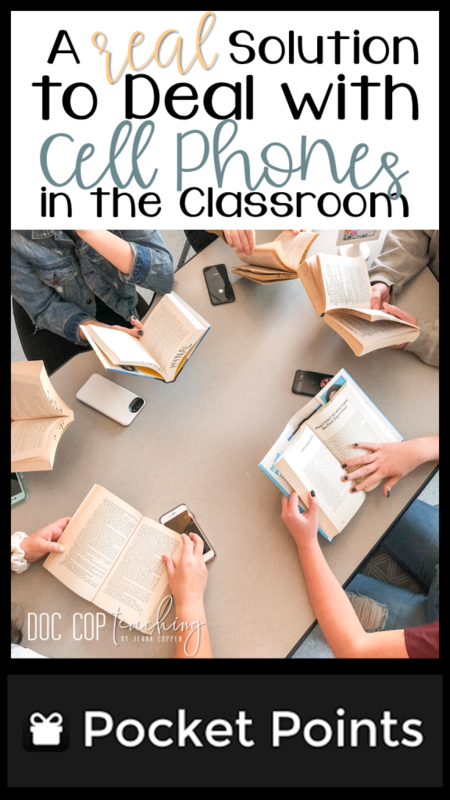 If you’re like me, you hate dealing with the distraction of cell phones in your classroom. You’d rather be spending your energy on your lessons and activities than worrying if students are misusing them in your classroom. Still, whether we like it or not, the reality is that cell phones are in schools, and they are a distraction. You may have tried common solutions, like contracts, charging stations, detentions, pleading, etc. I sure did. I even tried one of those shoe organizers on the wall on the wall hacks from Pinterest before realizing it was one cell phone away from crashing down on the cement floor…with the expensive cell phones in it. Essentially, I was looking for a policy that wasn’t reactive or punitive. That’s when I found PocketPoints. What I love about Pocket Points is that it is a proactive and incentive-based cell phone solution, and it’s FREE. The point is to provide students with a goal for earning minutes off of their phones during your class times. When students come to your class, they earn points for every minute they are not on their phones. Then, when they meet their goals, they earn rewards. The rewards can be individual based (such as five bonus points for a student) or class based (such as a fun activity, like an escape room). Even better, students can use it out of class too to earn points. They can set their own goals and earn points to cash out at businesses. For example, one of my students cashed out points to earn a free appetizer at Buffalo Wild Wings. How did it work in my classroom? After receiving approval from our technology committee, I decided to do a trial run with my English 12 classes during their choice reading unit. Our classes are 44 minutes long, and I estimated that they would be in class for a total of 14 hours during the unit. Therefore, I made their challenge to earn 11 hours by staying off of their phones by the end of the unit. In return, they could earn 10 bonus points on their project at the end of the unit. How did my students do? Overall, the students’ attitudes were overwhelmingly positive! Though I gave them the option to participate or not, every single student decided to try it out. One thing, I observed was that it became a class culture in which students reminded each other to stay off of their phones. Many even reported that they started using it for homework and out-of-school time too. What problems or issues did we have? The phone worked but wasn’t giving them credit. There are actually two solutions that worked here. For some, they just needed to update their phones. For others, they had to adjust their settings to make sure automatic calculating was on. Pocket Points has a great chat feature on their website, and they are great about troubleshooting quickly. Club Day periods changed the time of class. Thankfully, Pocket Points gives you an alternative day schedule option. I added that alternative schedule. Then, on those day, I pressed a button to activate the alternative schedule. In retrospect, I would not make the due date specific to one unit. Rather, I would give them one big due date at the end of the nine weeks with several small incentives as we went. This is mainly because with students being out of class for different activities or illnesses, it made an unfair playing ground for some. Obviously, this was a trial for me, but I also plan on starting Pocket Points from day one next year. For the rest of the year, I’m going to add some new fun rewards. Pocket Points has a lengthy list of reward ideas that you can find here. I’ll definitely consult this list next time I create a reward. Create an account for teachers. Under the classes tab, create your classes and incentives. Once you have it all ready to go on your end (it takes about 5 minutes to set up), you can invite students to join class. Ask them to download the Pocket Points App on their cell phones. After opening the class, they will be prompted to join your class with your course code. You’re ready to enjoy an engaged, happy class!